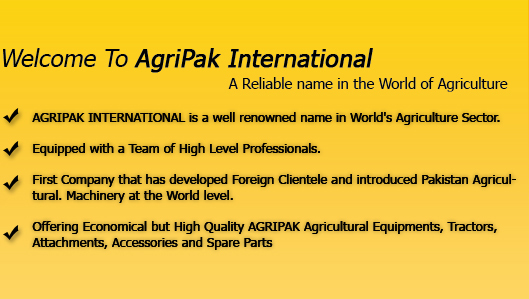 The company was established in 1970 to cater the Agri Machinery demands of Local Farmers in a small city of Pakistan. For 3 decades it took a waste experience in Agri machinery field by representing Major international Brands in Pakistan. In the year 2000 the track dimension has changed and the management decided to step-in the International Market. At present, the company has its own 3 Manufacturing Units of agricultural implements, Hydraulic Equipments and Municipal Equipments. The company is operating in Pakistan with its 05(five) pre-owned Area Offices; located in Karachi, Lahore, Hyderabad, Multan and Gujranwala. Achieve profitable growth by designing, manufacturing and marketing specialized, high-quality products and services for agriculture & municipality worldwide. All our actions are aimed at providing our customers with superior service, the best long-term value, and maximum return on investment. Our development is supported by our values. They have contributed to our success and the growth of the AGRIPAK brand for nearly 39 years! • Provide accessible and reliable support services. Being a professionally owned company, we will ensure continued success through the achievement of performance and financial goals. Satisfied the shareholders and stable ownership contribute to the Company's long-term strategy and development. © Copyright 2010 AGRIPAK INTERNATIONAL. All Rights Reserved.